Plague Marines armed with bolt pistols are used primarily for assaulting the enemy at close quarters. I paint my Plague Marines which are used in an assaulting role green. This squad started it all. Originally used as allies back in the black codex days, from humble beginnings the entire chapter was born. The first batch was made up of converted plastic loyalists with chaos backpacks with a smattering of metal chaos models. Much of my army is made that way. Today with actual plastic Chaos marines available, plague marines even, it would be a lot easier to realize my vision. I try not to have two models look alike thus the poseable plastics are a great aid. This model although out of print was painted after third edition was released. It is painted in a newer but not my latest style. Infuriating Owen I've taken to painting lots of tiny little lines as far as I know this was something I came up with on my own, examples of this style will be scatter around the site. All the Green squads have green (Bilious) ensignia and eyes. They should have purple tubing for the most part. This squad had three flamers to help kill infiltrators and jet bikes in second edition, that was how they earned their name. This squad needs a new mo' clever name, The AZOOR never really won me over. 6th Edition is out and I'm thinking of running a throw back list while I slowly paint up some new toys and army centerpiece type models. Mainly I just want to play and I've painted about every plague marine or nurgle renegade possible. Enough to max out troops that is for sure. Maxing out on troops seems to be back envogue. This model was painted while I lived with Owen, it is pre tiny line style. None the less it is well painted with nice work on the face and plasma pistol. This is perhaps the best model of this period of plague marines released by GW. 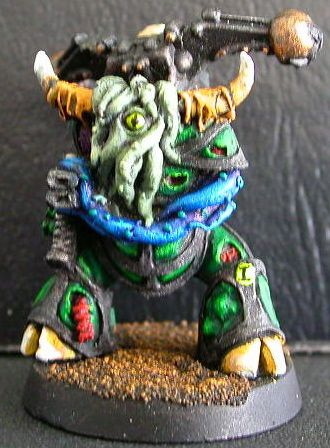 This is usually used as an aspiring champion but as I often forgot, technically a regular plague marine was able to be armed with a plasma pistol for many a year. With my latest revision to my army after 4th Edition was released and I was unemployed for an extended time following my MBA, this squad fell into little use. I think Plasma Pistols are good but I generally opt for Flamers or Meltas for my assault squads. One day I plan to try out three plasma pistols in a single squad, that is still legal in the new Codex. I have more green plague marines than just those in these three squads, the others were used as HQ or Chosen in previously rules/army lists and can be dropped into a squad if absolutely necessary, say to make them Havocs. But in general I think I have enough plague marines painted green and with the release of yet another new rule book I just plan to move a few models around by repainting their kneepad. This is another clever name. In third edition it was used as my Lord's retinue on occasion as many of the older models could only be fielded as aspiring champions. I've since moved models around between the three green squads and stripped a few models, a few too many perhaps with the release of a fourth Chaos Codex allowing Nurgle renegades with heavy weapons. This model actually shows how the Diseased Sons ensignia ties in with the plague knifes. This model was painted a fairly long time ago based on the way the backpack was done and the minimal highlights. This model was painted for 2nd edition back when swords were better then other CCWs. I'm partial to melta guns because they can hurt vehicles and they kill foot soldiers dead. With the arrival of fourth edition I began to expirement with bolters on my plague marines again. This is the assault squad that can have bolters instead of bolt pistols. They generally ride around in a Rhino and along with the Burning Sores are integral to my proposed third GT Army. Now almost all Chaos Spacemarines, including Plague marines come with a bolter and a bolt pistol. I think it was like this in the first edition of Warhammer 40,000, even at the dawn of the second edition during the black Codex days when the Diseased Sons got their start.